I missed reviewing Sleeping Giants when it first came out. I've finally got round to picking up a copy to find out it's now been out long enough that there are two further novels in the series: Waking Gods and Only Human. Back in 2016 It was one of those break-out novels such as The Martian and Wool, where the author self-published and found an audience there before it was picked up by a major publisher. It was also optioned for a film, although there is little news on that front (Googling find's only a unrelated film called Sleeping Giant). 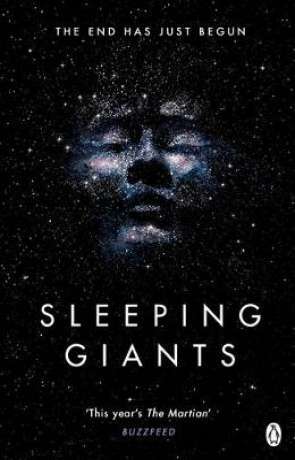 As I write this I've already picked up the sequel, a good sign I enjoyed Sleeping Giants. It starts when 11 year-old Rose Franklin falls into a hole in a forest near her home, landing inside the open palm of a giant metallic hand. No one can figure out where the hand came from or who it belongs to. Fast forward 17 years and Rose is now a highly trained physicist and part of a team who are tasked with investigating exactly what the hand is made of, who could have made it and what the hand belongs to. The story is told through a series of interviews with an unknown interrogator, along with a few reports and journal entries. This approach breaks up the story into a series of vignettes in a similiar way Max Brooks did with World War Z. It's an interesting way of presenting the story but it did take a bit of getting used to. Once I did however I found the book difficult to put down, with a friendly and immersive writing style. Much of the book is taken up with finding the various bits of the robot and then figuring out how it works, along with the relationship between the three pilots who try and control it. There is an interesting examination on the human reaction to the unknown, along with the difficulties inherent in the discovery of new, untapped powers. There is also a good amount of time taken up with the political ramifications such a discovery might uncover. If one nation controlled what could potentially be the worlds most powerful weapon, how would that effect world stability - could it actually bring peace? There is also a neat idea of where the robot came from, and for what purpose - something I hope is expanded upon later in the series. Speaking of the continued story, the book finishes on one of the most effective cliff hangers I've read in some time - It really did want me to track down the next book as soon as I could. Sleeping Giants is an accomplished novel and different enough to stand out. Breaking up the story means the pace is fast, which is a juxtaposition to the plot itself - which gives breathing room to the authors ideas without much in the way of action or suspense. It does however still manage to feel like a thriller in the way that the various suprises are dished out and when they are, its totally gripping. Highly recommended read. Written on 24th September 2018 by Ant.